Union busting has gone public, making laws not flouting them. "...union-busting has traditionally been a matter for private business. But this winter it has suddenly gone public, and its weapon is not flouting laws but making them." Wisconsin public employees pay 100% of their pensions! What’s happening in Wisconsin is...a power grab — an attempt to exploit the fiscal crisis to destroy the last major counterweight to the political power of corporations and the wealthy. And the power grab goes beyond union-busting. The bill in question is 144 pages long, and there are some extraordinary things hidden deep inside. Gonzo journalist Ian Murphy heard one of Wisconsin's Senate Democrats complaining that Gov. Scott Walker was impossible to reach on the phone. So Murphy came up with a prank call: He posed as right-wing financier David Koch and called Walker's receptionist. Shortly thereafter, he was on the phone with the governor himself. In the interview Walker admits that he considered infiltrating the demonstrations, jokes about bashing unions with a bat and declares that he is not a pragmatist, but a conservative. In other words Walker isn't interested in solving problems. He is a true believer whose commitment is to an ideology not solving Wisconsin's problems. This explains why even after the unions have agreed to his economic demands he continues to demand to that public employees give up their democratic right to have a union. The Washington Post's Ezra Klein writes that "... the transcript of the conversation is unexceptional (I disagree), the fact of it is lethal. The state's Democratic senators can't get Walker on the phone, but someone can call the governor's front desk, identify themselves as David Koch, and then speak with both the governor and his chief of staff? That's where you see the access and power that major corporations and wealthy contributors will have in a Walker administration, and why so many in Wisconsin are reluctant to see the only major interest group representing workers taken out of the game. The critique many conservatives have made of public-sector unions is that they both negotiate with and fund politicians. It's a conflict of interest. Well, so too do corporations, and wealthy individuals. That's why Murphy -- posing as Koch -- was able to get through to Walker so quickly. And it shows what Walker is really interested in here: He is not opposed, in principle, to powerful interest groups having the ear of the politicians they depend on, and who depend on them. He just wants those interest groups to be the conservative interest groups that fund him, and that he depends on. A group of Republican and Democratic lawmakers said Monday that they would seek to use budget legislation the House will consider this week to try to block the Education Department from carrying out regulations requiring vocational programs (and all programs at for-profit colleges) to ensure that they prepare students for "gainful employment." In an interview in his office, Representative John Kline (R-Minn.), chairman of the House Committee on Education and the Workforce, said that he and three other lawmakers would sponsor an amendment to the continuing resolution legislation that the House could take up as early as today. The measure would bar the Education Department from using any of its appropriated funds in 2011 to promulgate or enforce the gainful employment regulations, which for-profit college officials have fought on a variety of fronts. Kline, who spoke with reporters along with Representative Alcee Hastings, a Florida Democrat, said the lawmakers were confident that the House would pass the legislation, and hoped that that vote would send a "strong signal" to "the administration and our friends in the Senate" that "somebody ought to take another look at" the wisdom and fairness of the rules. "We have an opportunity right now to make a statement." Kline said the lawmakers objected both to the one piece of the gainful employment regulation that the department has already published -- which requires institutions wishing to create new vocational programs to get the Education Department's approval to do so -- and to the forthcoming portion of the rules that would institute a new set of outcomes that vocational programs would have to meet. Inequality is growing in the United States. In recent decades, the bulk of income growth has gone to the top 10% of families. That was not always the case. Throughout most of the 20th Century, and particularly following World War II when more than 1/3 of all workers were represented by unions, the bottom 90% claimed a much larger share of income growth than they have in recent years. The chart below from Economic Policy Institutes's’s new interactive State of Working America Web site, compares the distribution of income growth over two periods. Between 1948 and 1979, a period of strong overall economic growth and productivity in the United States, the richest 10% of families accounted for 33% of average income growth, while the bottom 90% accounted for 67%. The middle class grew and the overall distribution of income was stable for these three decades. 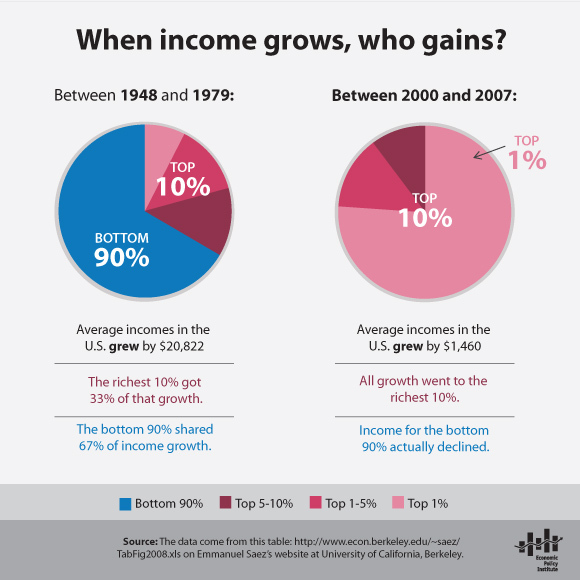 In an extreme contrast, during the most recent economic expansion between 2000 and 2007, the period that led up to the Great Recession, the richest 10% accounted for a full 100% of average income growth. During the same period, average incomes for the bottom 90% of households actually declined. Federal earmarks represent less than half of 1% of the federal budget. Compared to the trillion dollar (and counting) wars in Iraq and Afghanistan, the $1.6 trillion Bush era high income tax cuts, the $500 billion prescription drug bill, and the recession, earmarks have played virtually no role in creating the deficit. Yet Republicans have made earmarks a national issue. The House of Representatives has banned them as has President Obama. Now local communities, like Burnett County, Wisconsin, that used these federal dollars to fund socially necessary local projects are having second thoughts. Local governmental leaders from both political parties have realized that the moratorium on earmarks will force them to eliminate valuable and necessary projects or raise property taxes to pay for them. Just a few weeks ago, Republicans in the House of Representatives insisted that the Bush era tax cuts be extended for those making over $250,000 annually. This will cost $81.5 billion over two years and Burnett County the modern communications system that it sorely needs and cannot afford.. The New York Times article on how local officials are rethinking the ban on earmarks is linked here. The Leadership Conference on Civil and Human Rights, a coalition of more than 200 national organizations, on Thursday released a letter strongly endorsing the proposed "gainful employment" regulations that would deny federal financial aid to programs that do result in employment with compensation sufficient to repay the loans. The proposal is opposed by for-profit colleges that have spent hundred of millions of dollars lobbying against it. The letter is designed in part to counter the lobbying campaign of the for-profit colleges which has argued that they institutions are helping low-income, minority students advance economically. What happened to Governor Walker's jobs agenda? As Gov. Scott Walker on Tuesday delivers his first "state of the state" address, working men and women across Wisconsin are wondering what happened to the jobs agenda that played such a prominent role in November's election. As a candidate, Walker pledged that addressing unemployment - currently 7.5% statewide but higher in urban and some rural areas - would be his administration's top priority and the focus of a special session of the Legislature. It was part of his promise to create 250,000 jobs by 2014. So far, it's hard to pinpoint any action by the governor that creates a single job or does anything to boost the state from its economic slump. There certainly isn't a new job to be found in Senate Bill 1 and Assembly Bill 1, the so-called tort reform legislation passed during the session. The measure severely limits the legal protections of workers and consumers injured through acts of corporate negligence or malfeasance, such as the "Big Blue" crane accident that led to the deaths of three ironworkers during the construction of Miller Park. A witness testifying on behalf of the legislation flatly refused to say if it would create any jobs, calling it a "trick question." Other initiatives by Walker and his allies are, to be blunt, head-scratchers. Without corresponding revenue increases, tax breaks for a handful of small businesses, deductions on health savings accounts and a voter ID bill actually will add to the state's $3 billion budget deficit. As a result, these moves threaten essential state programs such as health care for the elderly and education. And while reasonable observers can disagree about the precise number of jobs lost during the high-speed rail fiasco, no one disputes the fact that the employment and economic opportunities in the construction, retail and manufacturing sectors the train would have brought are now gone. In his address Tuesday, Walker probably will try to pin the blame for Wisconsin's budget woes on the wages and benefits of state workers. It's an argument that's unfortunate and misguided. State workers and their families, like their counterparts in the private sector, have made enormous sacrifices: Furlough days, double-digit jumps in payments for health care premiums and wage freezes have stretched and broken the budgets of public servants in every corner of the state. Demonizing public employees and their families is wrong. The fact is that the state's finances will not improve until Wisconsinites are working again. The governor was elected on his promises to create family-supporting jobs, improve economic opportunities and build businesses. Working families all over Wisconsin are cheering on the governor to make good on his promise to spur job growth. But we know that taunting elected officials from Illinois and putting up new signs at our borders are not serious job creation efforts. Walker has formidable resources to accomplish his agenda. His allies control both houses of the Legislature, and he has one of the most powerful veto pens in the country. So, will he use his power to do what he promised and focus on creating family-supporting jobs for Wisconsin? And, no, that's not a trick question. This article is linked here. .